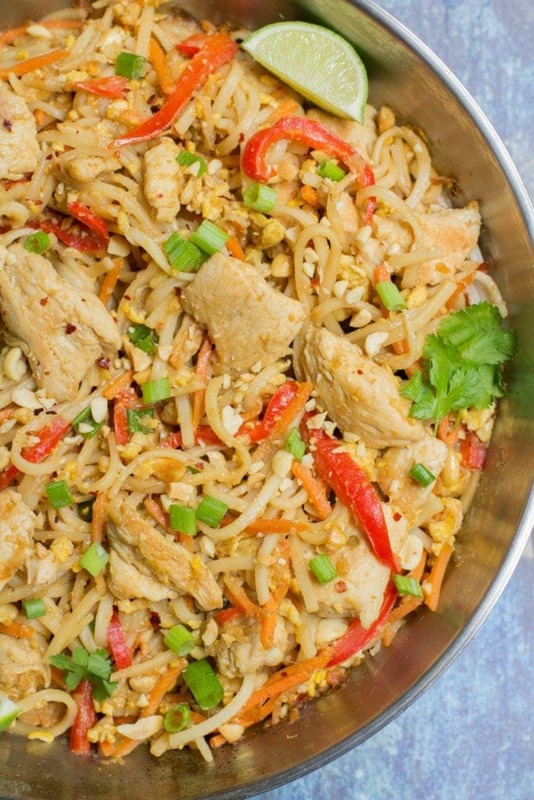 Skip the takeout and make this Healthy Chicken Pad Thai recipe instead! 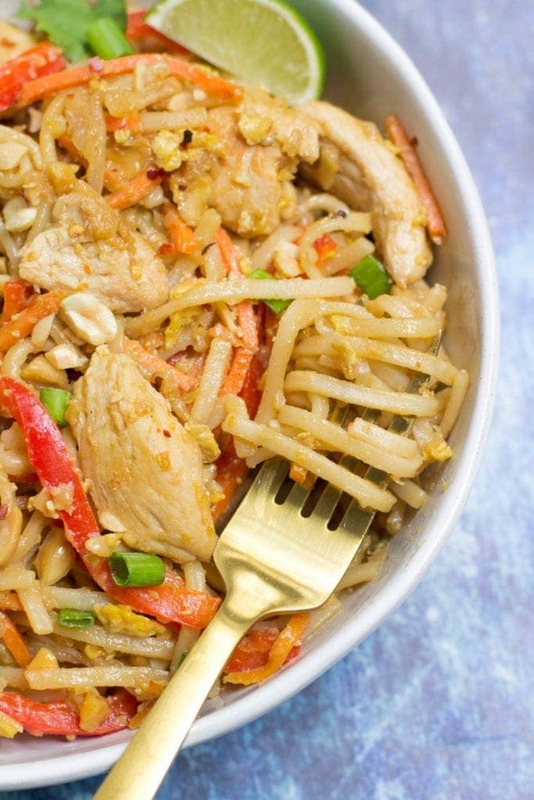 This gluten free pad thai recipe is a healthier version of a classic takeout dish. Packed with veggies, chicken and brown rice noodles. I feel like I start every blog post by saying the recipe is my favorite, but in reality.. this Healthy Chicken Pad Thai recipe has 100% taken the number 1 spot on my list of favorite recipes. 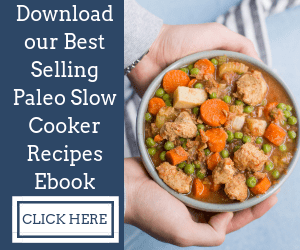 It is ridiculously delicious, simple to make, and a healthier version of one of everyones favorite takeout meals… what’s not to love?! Jam packed with ALL the veggies, lean protein, and healthy carbs thanks to brown rice noodles – it’s an easy meal everyone will love! When Tyler and I first started dating, I had never tried Thai food. When he picked a Thai food place on a date night – I thought for sure that I wouldn’t like it. Turns out I was wrong. Years later… I’ve fallen in love with Thai food + can’t get enough of it. It’s our go to whenever I’m sick of cooking (which usually happens on Friday or Saturday night). 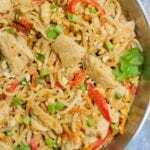 I know it is sooooo not good for me.. which is why I recreated it at home with this Healthy Chicken Pad Thai recipe! If you’ve ever tried Thai food – you probably know that it is a sodium overload + can leave you feeling pretty gross after you enjoy it. Step 1: In a pan, bring water to a boil and cook noodles per directions. Get your veggies and chicken ready. In a separate pan brown your chicken. Once browned, set aside. 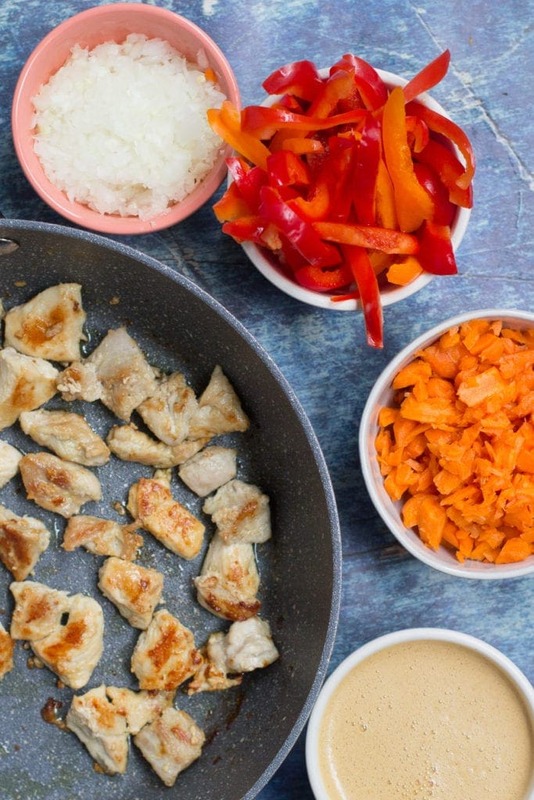 Add your veggies to the same pan as the chicken and sauté veggies until they are soft. 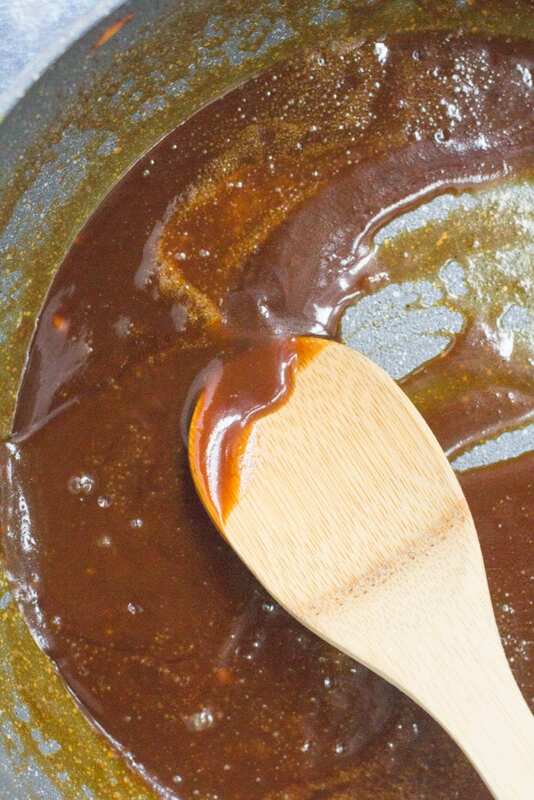 Step 2: While your veggies are cooking, whisk together your sauce. It should look like this. Step 3: Once your veggies are cooked, remove your veggies from the pan and add in your sauce. Bring it to a boil until it thickens. Make sure you allow it to actually bubble/boil. You’ll know it’s thick enough once it starts to pull away from the pan as you stir it! Step 4: Once your sauce has thickened, add your chicken, veggies, and cooked noodles back to the pan. Toss them around until everything is coated. Add in chopped peanuts and optional: cilantro, green onions and extra limes. Serve + enjoy! The next time you’re craving takeout, try making this instead. It takes the same amount of time to make as you’re probably going to have to wait for delivery anyways, so you might as well try it! Can you use zucchini noodles instead of brown rice noodles? , but the last time I made it I did a 50/50 split zoodles to brown rice noodles and it was so yummy! Lower in carbs and extra veggies. Make sure to really squeeze all the liquid out of the zucchini noodles to avoid them from getting soggy! Do you need to use fish sauce in this recipe? Egg free: You can simply omit the eggs. Vegetables: You can omit the bean sprouts if you’re having a hard time finding them. Bulk up the dish by adding more carrots or peppers! I’ve also added in mushrooms and it was yummy! 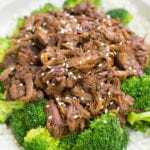 Looking for other healthy takeout fakeout recipes? Try these! 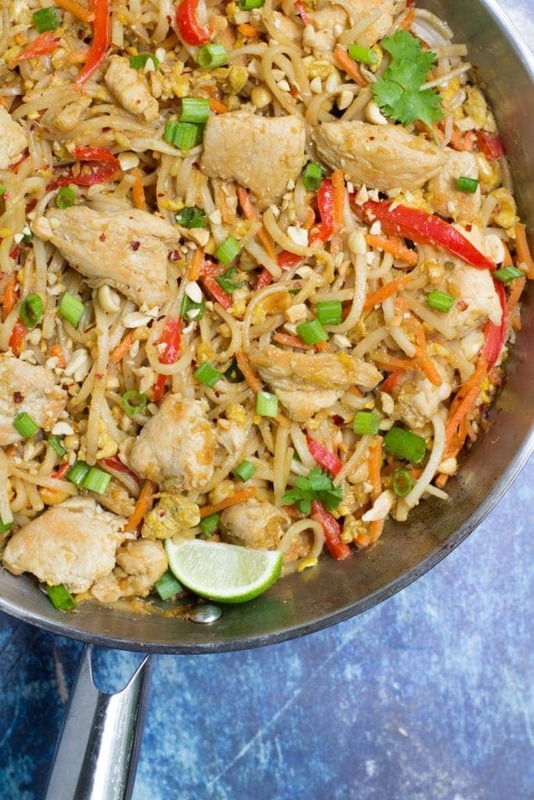 Skip the takeout tonight and make this Healthy Chicken Pad Thai recipe for dinner instead! 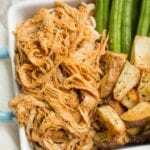 This lighter pad thai recipe is a healthier version of a classic takeout dish, packed with veggies, chicken and brown rice noodles. Bring a pot of water to a boil + cook rice noodles according to their directions. While noodles are cooking, in a separate pan, heat olive oil. Add in chicken to the pan and cook over medium high heat for 12-13 minutes until completely browned. While chicken is cooking, whisk together the sauce ingredients + set off to the side. Chop vegetables. Once chicken has cooked, remove chicken from the pan + set aside. Make sure to leave the oil in the pan. Add in peppers, carrots, garlic and onion to the oil and sauté for 5 minutes. Stir in bean sprouts and cook for an additional 2 minutes. Push vegetables to one side of the pan + crack in eggs. Scramble eggs until cooked, approximately 2 minutes. Stir veggie / egg mixture and add to the chicken in a dish the side. 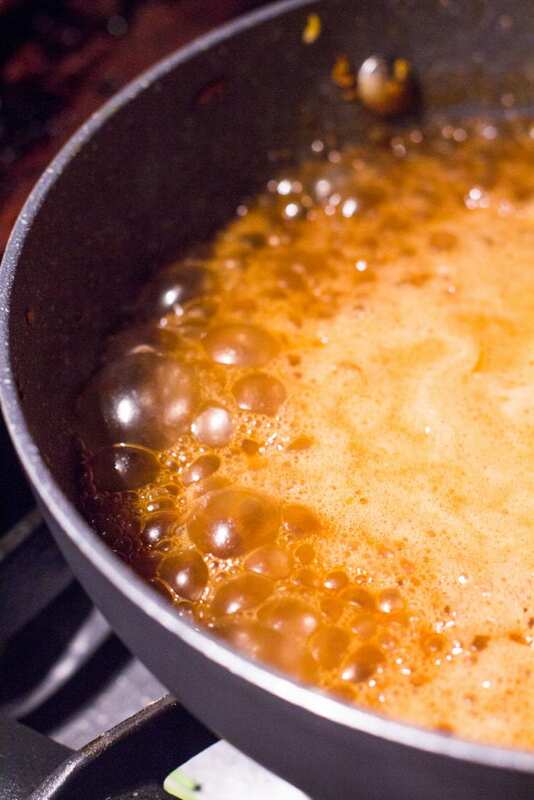 Add the sauce mixture to the empty pan and bring to a boil for 1 minute, stirring constantly. The sauce should bubble and slightly thicken. Add veggies, cooked noodles and chicken back into the pan and toss to combine. You can omit the bean sprouts if you're having a hard time finding them. Bulk up the dish by adding more carrots or peppers! I love this! 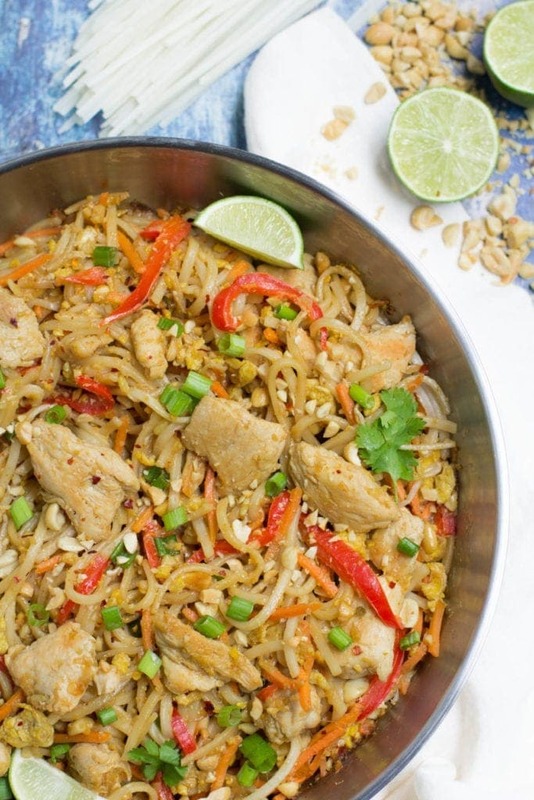 Healthifying Pad Thai is on my to-do list and this looks delicious! I would substitute Bragg’s liquid aminos for the soy sauce and make sure the honey is natural organic honey! This looks incredible! I would love to try this out, but if only I hadn’t eaten all of my zoodles before! Now I have to go to the grocery store to get some more zucchini! You’ll have to go get more zucchini – you’re going to want to try it! This is pretty good, but there’s nothing like the real deal! I love Thai food, but I don’t usually try it at home. Fortunately I have a favorite Thai restaurant that uses fresh food, less soduim and has several vegan options. 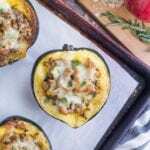 Great idea to substitute zoodles! That is so awesome! I wish we had a place like that near us. I love a good pad thai recipe, especially one I can feel good about eating! I’ve made it with spaghetti squash before, but never zoodles! Can’t wait to give this a try. 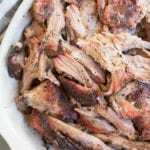 Looks like an easy weeknight dinner that the rest of my family would love! You should try it! I’m sure your family would love it! gorgeous pad thai! i am on a thai food kick so i need to try this out!! Man, does this sound good! You have to try it!! It is soooo delicious! I was skeptical at first too – but I’m so glad I tried it! I’m not much on Thai but dang this looks good it may make me change my mind. I hope you’ll change your mind and try it! Great idea for a vegan/vegetarian substitute! I bet that would be yummy! gorgeous photos! my hubby would LOVE this meal! I used to make pad thai all the time! I’ll have to try your version! This is gorgeous!!! Love all the fresh color in your version. Can’t wait to try it. Thanks, Julie! I love any recipe that is packed with veggies/bright colors! Now I’m craving Pad Thai. I haven’t had really good Pad Thai in years since I moved away from my favorite Thai place. I can’t wait to see about trying this recipe. Hubby is picky, but the next time he goes away on business, momma is gonna cook this up. Pinned it for later. Thanks for adding this to the the Thursday share-fest post on facebook! It has such a yummy flavor! Beautiful photos! I love Pad Thai and yours looks truly flavorful and delicious. 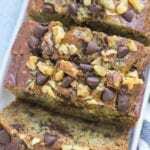 Thanks for sharing this incredible recipe. Yum! Oh yum! I need to try this! Thanks, Elizabeth! It’s super tasty! LOVE pad thai! This looks delicious! Pad Thai = dinner weakness, takeout favorite, overall obsession. I’ve made countless versions at home, each all a little different. I can’t wait to make yours now too!!!! Same here, Chrissa! I could honestly order/eat it for take out every night! 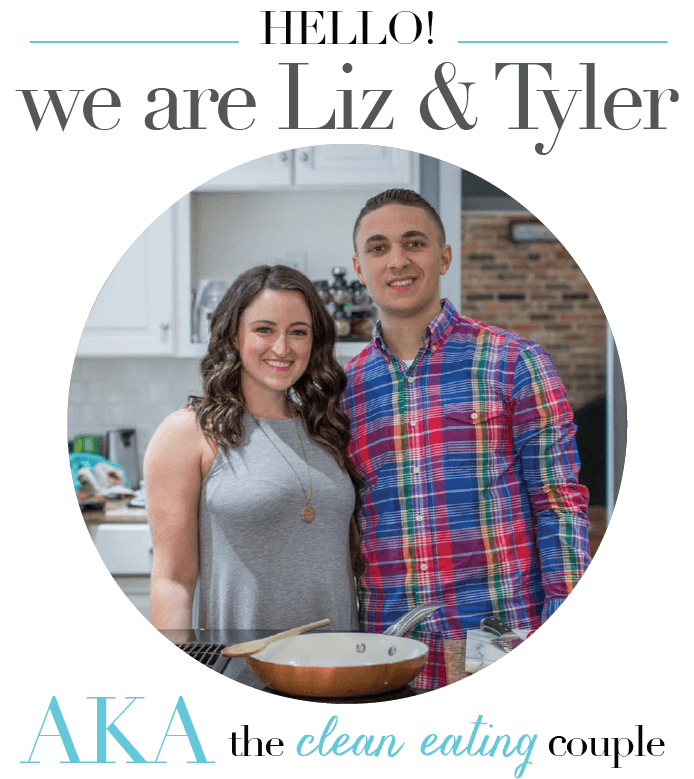 This looks AMAZING Elizabeth! I love Pad Thai & am thinking this is perfect! Can`t wait to give this a try! Thanks for the GREAT recipes! Let us know if you give it a try! It’s so yummy! Can you substitute or leave out the fish sauce? Hi Pam – I haven’t tried it, but you can probably just sub in soy sauce and I’m sure it will work fine! Yay!! I’m so glad you liked it, Kaitlyn <3 We love it just as much as you do! 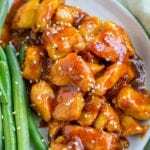 This is one of my favorite dinner to make at home! It’s very easy and simple to make! You can find everything at Aldi besides the fish sauce and coconut aminos. I’m so glad you like it Sam!! It’s one of my favs too! I normally get the fish sauce and coconut aminos at Trader Joe’s – I find they have the best prices!! Oooh I need to try that!! Sounds yummy! We LOVE Pad Thai so I was a bit nervous to try this and it not be up to par. It was really good! We didn’t have coconut aminos so I just used low sodium soy sauce. Once that is gone I’d like to use the coconut stuff instead. My husband isn’t a big fan of fish sauce but still ate 2 helpings. 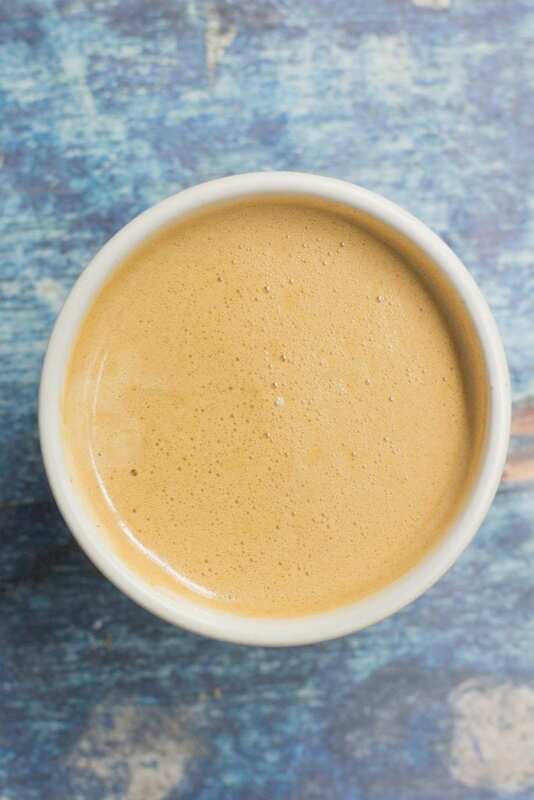 I may try it with 1/8th cup next time and the rest coconut, but I’m not sure. I really liked it the way it was. Even had it cold today as a left over and was so good that way too. I’m glad you all liked it!! 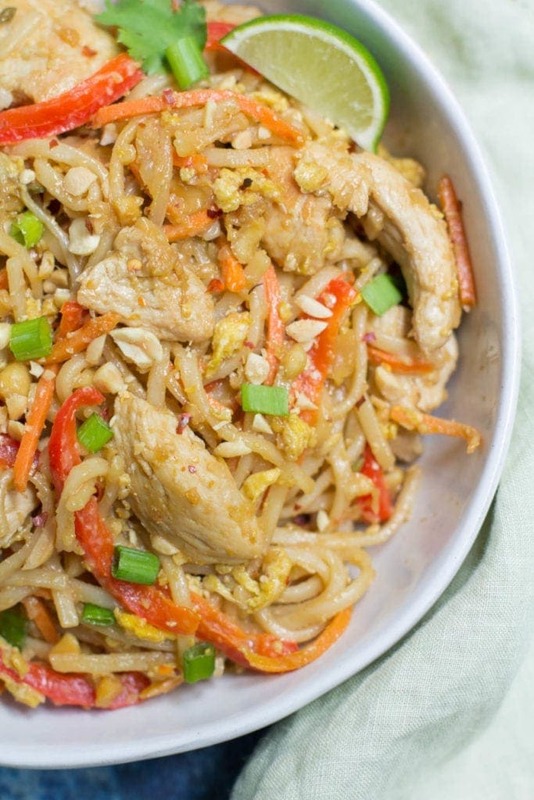 I’m pretty picky about my pad thai too but we love this even more than takeout!! You definitely could make these with the substitutions you mentioned above – the fish sauce isn’t necessary if you’re not a fan! Ok, this was delicious! I’ll definitely be making this again! I used spaghetti squash instead of noodles and I highly recommend! Only thing I could say is it was a little salty, but that might’ve been because I added to much to my chicken…lol. Thank you, thank you for this! Hi Teagan – I’m so glad you liked it!! I feel the same way about it – it always disappears in our house, lol!! So glad you liked it, Melanie! !